Jurgen Klopp has told Mohamed Salah to take some inspiration from the way Sadio Mane is playing for Liverpool at the moment. While Salah was far and away Liverpool’s stand-out performer for so much of last season, Mane has emerged as the main man for the Reds this term. The Senegal international is going through a real purple patch in Klopp’s side and has been a joy to watch to guide the team through some big games recently. 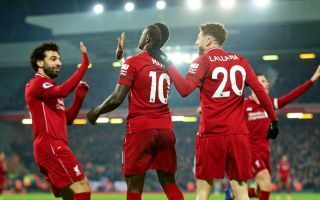 Discussing the pair, Klopp said that Salah should look at the way Mane worked hard to get where he is now in a subtle nod at the Egyptian explaining how he can become LFC’s main man once more. “He is in a really good moment, of course,” the German tactician told Liverpool’s official site. Liverpool fans won’t be too bothered about who’s scoring all the goals as long as they can continue their march towards the Premier League title. The Merseyside giants went top of the table again before the international break, but Manchester City have a game in hand.